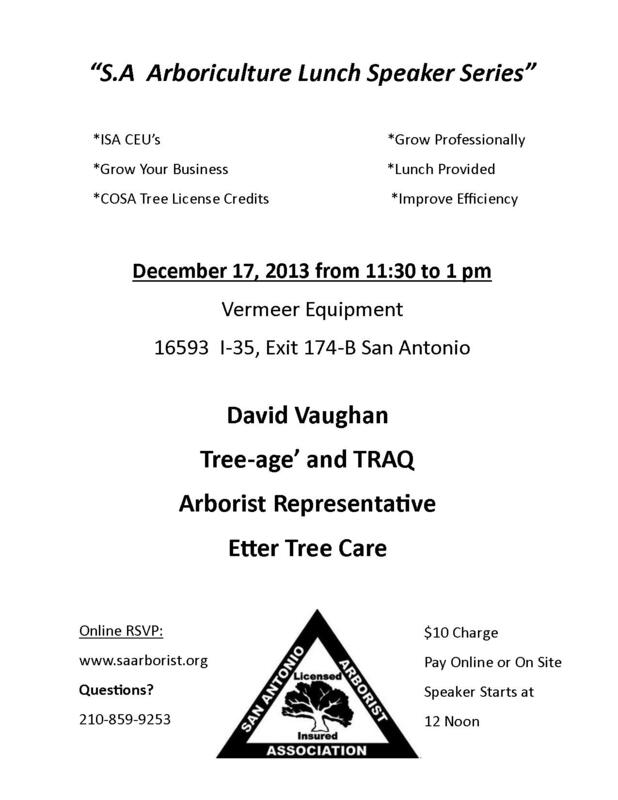 Come hear David Vaughn speak about Tree-age and TRAQ. Attend ASCA's 2013 Annual Conference and expand your knowledge and skills. You'll hear all about the latest research and learn how to grow your business. Plus, you'll have plenty of time to network with your peers--leaders in the arboricultural industry. The Texas Chapter ISA is offering the new ISA Tree Risk Assessment Qualification (TRAQ) course and assessment. TRAQ provides an opportunity for arborists to expand their knowledge through education and training in the fundamentals of tree risk assessment. This qualification promotes the safety of people and property by providing a standardized and systematic process for assessing tree risk. The results of a tree risk assessment can provide tree owners and risk managers with the information to make informed decisions to enhance tree benefits, health, and longevity. Skip Kincaid will be your instructor covering Tree Biology and Mechanics, Tree Inspection and Assessment, Data Analysis and Risk Categorization, and Risk Reporting. The Tree Risk Assessment Qualification (TRAQ) Course prepares the participant to take the TRAQ assessment to become ISA Tree Risk Assessment Qualified. The qualification consists of a two-day educational course followed by a one-half day assessment that includes both a written and field component. It is required that you attend the course and successfully complete the assessment in order to receive this qualification. Join local and state officials, nonprofits, business and citizens in celebration of trees. This years celebration will be in San Antonio at Texas A&M University - San Antonio, 1 University Way. Arbor Day activities start at 9am. Texas Arbor Day Has Moved! The official state Arbor Day is now held the first Friday in November. Fall is a terrific time to plant trees all across Texas. Celebrate Arbor Day by planting trees. A Scary Thought - No Trees! Be a part of the 2013 national action campaign to celebrate and plant community trees! Register all of your October tree plantings, tree workshops, urban greening days, invasive removals, and other tree events at www.NeighborWoodsMonth.org. It’s easy to register to be part of National NeighborWoods® Month, and demonstrates the great work your organization is doing. To help plan and promote your tree activities, ACTrees is excited to offer an assortment of valuable, free resources. Together, we can show that people care about trees and are taking concrete actions to improve our urban forests from coast to coast. Don't miss out! Register all your tree events. A one-day workshop for professional arborists, park and public works personnel, landscapers, Master Gardeners and Master Naturalists, and others who want to learn about proper tree care and maintenance. Connect to the Roots of Your Community. Become an Urban Forest Steward! The City of Austin Urban Forestry program and TreeFolks present the Urban Forest Steward series of workshops focused on building and protecting the urban canopy of Central Texas. Drought, invasive species and habitat degradation constantly take a toll on Austin's parks and natural areas. The Texas Forest Service estimates that Texas has lost up to 10 percent of its trees. The goal of the Urban Forest Steward series is to equip a cadre of citizens to help us gain ground in rebuilding our urban forest through education and volunteer leadership. The topics to be covered are extensive and intend to give volunteers the tools to educate, train, and lead other volunteers in planting and maintaining our urban forest. Topics include Stewardship, Arboriculture, Urban Planning & Design, Volunteer Leadership, and Sustainability. Class dates for 2013 are August 10 & 24, and September 14 & 28 from 9:00 am to 3:30 pm at the AWU Center for Environmental Research at Hornsby Bend. Registration for the 4-class series is $130 (TreeFolks membership included) or $100 for current members. 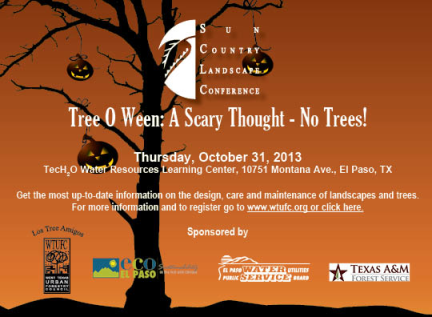 This training will be in conjunction with the Texas Tree Conference in Waco. The Electrical Hazards Awareness Program, or EHAP, is a training program that employers can use in conjunction with documented on-the-job skill training and assessment to increase awareness and assure the competency of their employees to work safely and to meet ANSI and OSHA requirements. A great review or introduction to basic tree care for tree workers. A stand-alone one day workshop that will be a combination of classroom and hands-on learning. Topics covered will include basic tree biology, tree pruning, ascent techniques review and chain saw operation and safety. Your instructors are Guy LeBlanc, Owner of Arbor Vitae Tree Care, Austin and Oscar Mestas, Regional Urban Forester with the Texas Forest Service, El Paso. A Spanish language workshop covering tree biology, soil science, tree selection, installation & establishment, pruning, and diagnosis & plant disorders. Expert speakers include Salvador Alemany and Mark Duff. The Awards will be presented during the Awards Luncheon at the Texas Tree Conference in Waco on October 4, 2013. Celebrate the accomplishments of those who have dedicated their talents to spreading a leafy green canopy over Texas by nominating them for the 2013 Texas Community Forestry Awards Program. Accidents involving brush chippers are a significant concern for tree care and landscape employers, the employees who operate the equipment, and manufacturers alike. With support from Altec Industries, Bandit Industries, Morbark Inc. and Vermeer Corporation, Tree Care Industry Association (TCIA) created the Chipper Operator Specialist credentialing program to train tree care employees in hazards, as well as accepted practices for brush chipper operation and other associated tasks. For crew members who often do not receive formal training opportunities, the program will increase employee involvement with overall safety compliance and provide an opportunity to earn a nationally recognized credential. Registration is only $25 and includes TCIA's Chipper Operator Specialist manual (a $35 value), classroom and hands-on instruction, refreshments and lunch. Attendees who complete the program will receive a hard hat decal, patch, certificate and wallet card. To register, go to http://tcia.org/training/tree-care-academy. For more information, call Margaret Spencer at 281-513-5224 or email mspencer@tcia.org. The upcoming Certified Arborist Preparation Course in San Antonio is a 32 hour course taught by qualified instructors across the test domains. The course will take place on the Fridays from between August 30th and September 20th from 9 am to 4 pm at the San Antonio Botanic Garden. The intent of the course is to give the attendee the information you will need to pass the Certified Arborist exam. Attendees will receive the Certified Arborist Study Guide for signing up. This course is a partnership between The San Antonio Arborist Association, Alamo Forest Partnership, and San Antonio Botanic Garden. that we create the framework and infrastructure so that we can maximize the benefits that our "green civil servants" provide. Keynote speaker James Urban, FASLA, a nationally recognized leader in urban design, well-known author and visiting lecturer at Harvard University Graduate School of Design will speak on designing the difficult urban environment to be 'tree-centric' and allow trees to thrive. Come to the 9th Annual Amarillo Tree Care and Safety Workshop on August 15, 2013. CEU's are available from ISA, TDA and Amarillo College. You'll also receive a t-shirt and lunch will be provided by Beef O'Brady's. For more information on how to register go to www.amarilloparks.org and thanks for your support of tree care and safety in West Texas. Nominations are being sought from the ISAT membership to fill nine positions on the ISAT Board of Directors. You may nominate yourself or another qualified ISAT member interested in serving on the ISAT Board. The Election Committee will fill the slate from the nominations. Elections will be held in August and the Board members will be installed at the annual membership meeting held at the Texas Tree Conference on October 4, 2013. Do you want to make a difference in the tree industry? Run for office on the ISAT Board of Directors. You’ll get to meet many of the leaders in our industry and feel good about paying it forward. The commitment is a two year term. There are four board meetings per year plus an annual ‘Retreat’ where we kick off planning for the year. And, of course, the time you’ll put into coordinating your volunteer projects. A good board member is hard working, self motivated, dedicated and community oriented. We have 5 seats open for the election. Send in a application form if you are interested in joining the leadership of ISAT. Registration is closed - all 20 slots are full. ISA Texas Chapter anticipates offering TRAQ again this fall. The Texas Forest Service and the Texas Chapter ISA are hosting the ninth annual workshop for ISA Certified Arborists on how to identify and manage oak wilt. Each participant that successfully completes the training will be awarded a Certificate of Training Completion. This training will be noted on the www.texasoakwilt.org website as well as on any handouts and other material referencing qualified individuals. Dr. David Appel and TFS Staff Foresters will be conducting the training. Registration is limited to 25. Share your tree knowledge with your neighbors! Have you ever wanted to brush up on your tree identification skills or share your tree knowledge with others? With the Great Texas Tree Trail you can do both! If you have an iPhone or an Android smart phone, or even if you just have a desktop or a laptop computer - you can create and share a tree trail right where you live. Your Texas Chapter ISA has teamed up with the Texas Urban Forestry Council, Texas Forest Service and others to create the Great Texas Tree Trail. If you would like to be a “Trail Boss” and contribute a Tree Trail, just go to www.GreatTexasTreeTrail.org and follow the directions on how to use or create a Tree Trail. A one-day workshop highlighting the latest products from DMM, New England Ropes, and Teufelberger! Registration is closed and walk-ups the day of the event will not be accepted. Certified Tree Worker workshop/test will be held June 8th and 9th (Saturday and Sunday), 2013. Note, this is an opportunity to perform all required tests and obtain CPR certification and aerial rescue training required to take the ISA Certified Tree Worker tests. This is not a learning workshop it is a testing opportunity. Only ten spots available due to the intensive hands-on nature of the program. You must submit your application to ISA headquarters by May 21st to be eligible for the test. REGISTER TODAY! Mark your calendars now for this years contest. Winner of this year's competition will represent the Texas Chapter in the internationals in Toronto. This is the best event of the year for a working climber to attend if you want to improve your skills. A one day workshop that will make you safer and maybe even save your life? Your instructor is Mark Chisholm, three-time world champion tree climber and a favorite for workshops in Texas. Mark will share his practical experience with aerial rescue and safety techniques in this one day, pre-Texas Tree Climbing Competition workshop. A little more than 18 months after the most destructive wildfire in Texas history, this Central Texas community is coming together once again, this time to celebrate resiliency, recovery and hope. 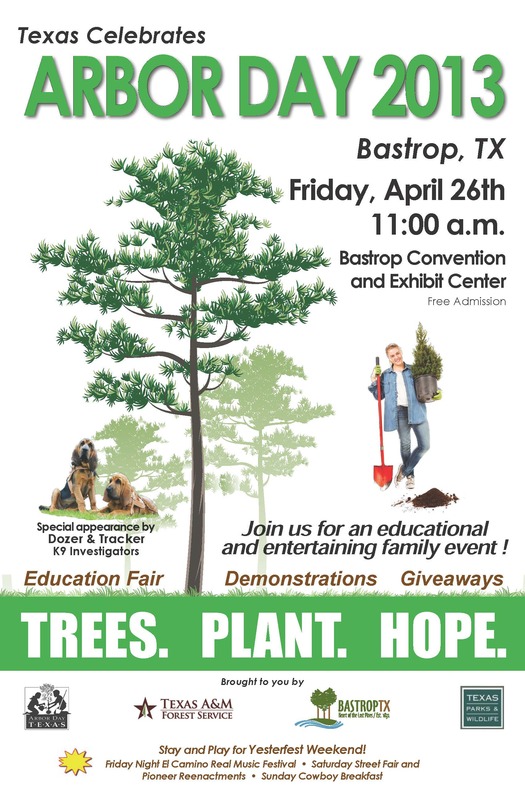 Those themes will be the primary focus as Bastrop residents join with state and local dignitaries this Friday to celebrate the 124thTexas Arbor Day. The official state ceremony will begin at 11 a.m. Friday, April 26, 2013, at the Bastrop Convention & Exhibit Center, 1408 Chestnut Street in downtown Bastrop. An Education Fair will immediately follow on the adjoining grounds. First observed in Texas in 1889, Arbor Day celebrates the planting and nurturing of trees, as well as all the ways that trees enrich our lives. The annual state celebration is held in a different city each year. This year, however, the observance is designed to shine a spotlight on the Bastrop community and its resiliency in the wake of a devastating wildfire that charred 32,400 acres, destroyed 1,660 homes and killed roughly 1.5 million trees. Since the September 2011 fire, residents have come together to reforest the community, planting more than a half-million seedlings. Plans call for roughly 3 million to 4 million more to be planted over the next four to five years. The state ceremony will feature Bastrop Mayor Terry Orr, and the city will receive a Tree City USA designation from the Arbor Day Foundation, honoring their commitment to urban forestry. Texas Parks & Wildlife Department Executive Director Carter Smith will provide the Arbor Day keynote address. The ceremony will conclude with the Education Fair, which is open to the public. It will feature various information booths and hands-on children's activities, as well as a special appearance by Dozer & Tracker, 5-month-old purebred bloodhound puppies who are in training to become Texas A&M Forest Service's newest K9 arson investigators. It's time for the 4th Annual Bilingual Tree Worker Workshop in San Antonio. Come learn from industry leaders such as Eduardo Medina from Davey Tree, Dr. Raul Cabrerra from Texas A&M Agrilife Extenstion, Jacob West from Bartlett Tree Experts, and Mark Bird from City of San Antonio. We will discuss professionalism in arboriculture, tree biology, pruning, and oak wilt. There will be demonstrations from CPS Energy's Arc Demo, chainsaw safety, large tree pruning and removal, and young tree pruning. We hope to see you there. Space is limited. Do you want to stand apart from the crowd, take your arboricultural career to the next level, and add to your growing list of credentials? If so, then the ISA Texas Chapter Master-Series Wood Decay Identification and Assessment Training Workshop is for you! Arborists are required to assess trees for decay as part of their daily work context, such as sales calls, climbing, or during formal tree risk assessment. This training program is designed to provide arborists with the ability to identify wood decay symptoms and signs in urban trees, identify wood decay fungi and wood decay types, and to provide hands-on practice in evaluating trees for decay. Application of decay inspection procedures relative to the new Tree Risk Best Management Practices will be discussed and integrated into the program. The workshop will use both classroom presentations and field exercises on assessment of decay in roots and stems. Participants will practice the concepts and techniques presented and will make their own assessments of the extent of wood decay in urban trees. 2013 Texas Wildlife & Woodland Expo and Spring Fling. Booth opportunities visit http://expo.tamu.edu for registration. Advanced training and volunteer opportunities for Texas Master Gardeners and Texas Master Naturalists. Badge opportunities for boy scouts and girl scouts. Kayaking Skills Tank (skills and safety) • Archery (skill and safety) Fly Fishing • Rod & Reel fishing (fishing/boating safety) Jakes Take Aim BB Gun Range (gun safety) • Hands on crafts with lessons Baytown Nature Center touch tank (aquatic) • GPS, Orienteering & Compass Wildlife-live animals (wildlife) • Wolves of St Francis (rescue/rehabilitation) Dutch Oven Society with History (history). Email expo@tfs.tamu.edu for more information. The Texas Chapter of the International Society of Arboriculture is seeking proposals for presentations for the 34th Annual Texas Tree Conference, to be held in Waco, TX October 2 - 4, 2013. This year, the focus of the conference is “Branching-Out” from Arboriculture and Urban Forestry to professions in related industries, such as Urban and Regional Planning, Landscape Architecture, Publics Works, and the Nursery Industry. Proposals for the conference will be accepted for 30-or 60-minute oral presentations during general and split sessions. Proposals for 30 minute field demonstrations for the Tree Academy are also being accepted. 2013 Certified Arborist Preparation Course brought to you by San Antonio Arborist Association, San Antonio Botanical Garden, and Alamo Forest Partnership. Would you like to earn your ISA Certified Arborist credential? Do you love trees and want to know more about how to care for them? This 4 day course will help prepare professional arborists for the certification exam. Everyone is invited to attend to gain a better understanding of the benefits of trees, improve their tree identification skills, and better care for their trees. Fee: $249, includes the Arborist Certification Study Guide (a $115 value). Ruthe Jackson Center in Grand Prairie, TX. The Trinity Blacklands Urban Forestry Council, in partnership with the Cross Timbers Urban Forestry Council is pleased to invite you to the 2013 conference. Some of the presenters you can expect to hear include: Dr. Drew Zwart, Plant Pathologist with Bartlett Tree Research Laboratory, Shawn Bernick, Vice President of Rainbow Treecare Scientific Advancements, and Joe Pase, Staff Entomologist with the Texas A&M Forest Service and more. Topics will include tree stress physiology, urban trees and insect stress, use of structural soils, biochar and growth regulators as mitigation techniques to lower stress and enhance tree health. As the Texas drought continues to linger and even grow, understanding how trees respond to environmental stress factors and how to mitigate them becomes more and more important. Come learn more about tree stress mitigation and how you can enhance your company's or community’s tree resource through better management techniques. Register here. Register by February 1st for early discount rate. Registration at the door is also accepted. If you or your company would like to serve as a vendor or sponsor to this year’s event please contact Micah Pace at mpace@tfs.tamu.edu or register as a vendor/sponsor online. Get ready to take the Certified Arborist Exam or just brush up on your tree skills. Arboriculture 101 is a four-day short course designed to provide practitioners with an in-depth knowledge of how to care for urban trees. Dr. Todd Watson, an ISA Board-Certified Master Arborist integrates research and practical experience in his teaching style. The course is built around the 12 domains of the Certified Arborist Exam. Race - Run - Tour. Early registration is by February 6th. Certification information and an application form can be obtained by clicking here. As with all Certification Examinations the application must be in the ISA office 12 working days prior to the Exam. ISA Certified Arborist computer based exam now available in Texas. To view computer based testing locations please choose the link below. In order to schedule a computer based exam, you MUST submit your application and/or retake form to ISA. The testing vendor will not allow you to schedule an exam directly through them. Computer based testing locations Contact Misti (Beirne) Perez 512.965.1076 for more information.